Scarlets boss Wayne Pivac has expressed a fear that prop Rob Evans could be out for a period that would include Wales' 2017 autumn Tests. Evans has failed to pass Head Injury Assessment (HIA) protocols since being injured against Connacht on 29 September. Scotland back-rower John Barclay is also still undergoing HIAs. "Aaron Shingler last year was about 12 weeks [out] so, you know, how long's a piece of string?" said Pivac. "I just don't know that we know enough about it yet." Wales face Australia on 11 November, Georgia on 18 November, New Zealand on 25 November and South Africa on 2 December. Evans was Wales' first-choice loose-head during the 2017 Six Nations, but was forced out of their summer tour Tests against Tonga and Samoa by injury. His rival Nicky Smith, of Ospreys, started in the two wins in June with Scarlets' Wyn Jones as his back-up. 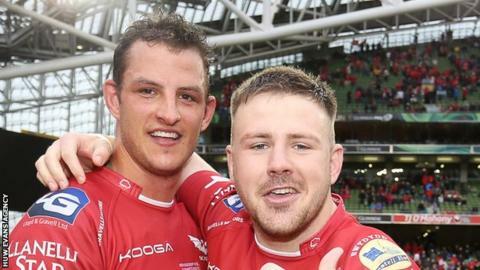 With Cardiff Blues veteran Gethin Jenkins also still on the sidelines following knee surgery, Evans' Scarlets understudy Jones could again fill that role for Wales in November. Pivac backed 25-year-old Jones to do just that, saying: "He had the call up when Rob was unavailable so I don't think too much has changed in Welsh rugby except Wyn's displaying, when he gets his opportunities, good scrummaging, he's been good around the field and I think his game's improving all the time." Pivac added: "We've got protocols in place which we follow. "At the moment both the boys [Evans and Barclay] are failing those protocols so they can't go on to the next step if you like, to get closer to playing. "There are signs of improvement, but they're taking a lot longer than the players themselves would like." Wales are already set to be without wing George North, who hurt a knee in Northampton's defeat by Saracens last weekend. Ospreys scrum-half Rhys Webb and back-rower Dan Baker are also worries after leaving the fray against Clermont Auvergne in the opening round of European games. Wales coach Warren Gatland is due to name his squad for the four autumn Tests on Tuesday, 24 October.